Whether you have a special gala to attend, a formal dance or an elegant soirée, whatever your excuse to get dressed up, you want to look and feel the best you, you can be. An evening gown can be one of the most flattering looks for a plus size woman. Stick to our simple guidelines and you won’t have any trouble picking out the best dress style for evening wear again. Before you read ahead, don’t forget to check out our Body Shape Guide to know exactly which dresses you should be wearing! Women with pear shaped bodies want to draw attention up the body, towards the shoulders and away from the hips. Look for styles with delicate beading and embellishment on the bodice, as well as bust accentuating necklines to draw attention towards the breasts. A line silhouettes are great for disguising wide hips and creating balance. Empire waistlines and dresses with exaggerated waistbands are ideal for drawing you in and accentuating your small waist. Clever draping will skim over any undesirable areas and strategically placed slits will elongate your body, giving you legs that go on for ever. Women with a rectangle body shape lack feminine curves so the aim is always to create curves. You can do this with fish tail hems, bottom details and texture, to create volume around your lower half. Accentuate your long torso with V neck lines and upper bodice detail, as well as cinching in the waist to create a curvier hourglass figure. Texture and movement are key when choosing an evening gown for a straight body, look for dresses with layers that add volume or inserts to create contrasting textures. To flatter an inverted triangle body shape, the idea is to minimize attention on your upper half whilst drawing the eye down and creating fullness around the hips and bottom. This is most easily created by lower half drapery, full skirts with flare and skirt embellishment. Do avoid strapless and spaghetti strap dresses as they make shoulders look more broad. If you have slender legs, feel free to choose a shorter length or a dipped hem if appropriate, to accentuate them. The most coveted of all the body shapes, and possibly the hardest to dress! Because of the equal proportions of an hourglass figure, it’s necessary to avoid too much going on at the top of your gown and also too much on the bottom, offsetting the balance. Aside from that, the hourglass can wear whatever she wants! An hourglass looks equally great in straps and strapless, fitted and flared, whichever style you like, you can certainly pull it off and look amazing! To really accentuate your figure and let everyone know about it, always cinch at the waist. If you have a round or apple shaped body, a sweetheart neckline should be your go to! It draws the eye down the body and towards the bust, making your assets the focal point. An evening dress with a little volume or flare at the end can be a great style for you, especially if you want to pull off the strapless look, which can make shoulders look wider than they are. Instead of cinching yourself at the waist, try an empire waistline, just under the bust, allowing the dress to elegantly skim over the waist area and pull you in at your smallest point. Diamond body shapes should dress similar to the pear shape, the only difference being that a diamonds bust is usually small and they don’t have the booty of a pear! Try creating some equal volume in your top and lower half by choosing full skirts and broadening necklines such as strapless and wide V’s. 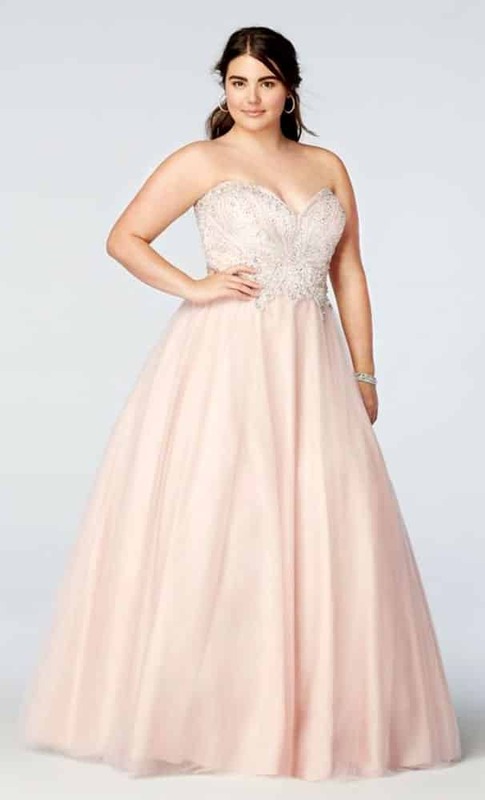 A strapless, princess style dress is the perfect match for your body shape as you don’t need too much support around the bust and the wide flare negates the need to disguise large hips. This entry was posted in Fashion, Night and tagged evening dresses, fashion, fashion tips.